In this post we discuss about what is the problem is occur in simple load balancer when we introduce sessions in our web application. and we will see how to resolve this issue. Its continuation of my first part of this series. so kindly go read my first part then continue here. How Session works in Servlet/Tomcat? Before going into problem, let see the session management in Tomcat. If any if the page/servlet create the session then Tomcat create the Session Object and attached into group of session (HashMap kind structure) and that session can identify using session-id, its just random number generated through any one of the hash algorithm. then respond to client with cookie header field. That cookie header field are key value pair. so tomcat create jsessioid is the key and random session-id is the value. Once response reached to client (Web Browser) its update the cookie value. If already exist, then its overrides the cookie value. Then all further communication browser send the cookie attached with request to that server. HTTP is stateless protocol. so server can't find the client session usual way. so server reads the header of the request and extract the cookie value and server got the Random session-id. then it search through group of session maintained by the tomcat. (It usually hash-map). then tomcat got perfect Session of that particular client (Web Browser). If client cookie value doesn't match with group of sessions then tomcat create the completely new session and send the new cookie to browser. then browser update it. 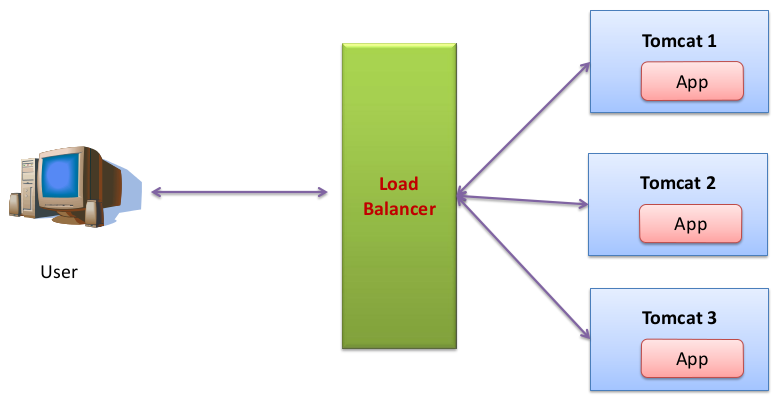 What is the Problem In Simple Load Balancer? If we deploy the web application, in which its used the session then actual problem is occurred. 1. User request one web page, in that web page its used sessions (like shopping cart). 2. Load balancer intercept the request and use the round robin fashion its send to one of the tomcat. suppose this time its send to tomcat1. 3. tomcat1 create the session and respond with cookie header to client. 4. load balancer just act as relay. its send back to client. 6.Load balancer intercept the request and use the round robin fashion its send to one of the tomcat. this time its send to tomcat2. 8. Client receive the response and update the cookie(Its overwrite the old cookie). 9. Client send one more time to request that page and send the cookie to server. 10. Load balancer intercept the request and use the round robin fashion its send to one of the tomcat. this time its send to tomcat3. 12. Client receive the response and update the cookie. (Its overwrite the old cookie). 13. Client send one more time to request that page and send the cookie to server. 14. Load balancer intercept the request and use the round robin fashion its send to one of the tomcat. this time its send to tomcat1. 16. Client receive the response and update the cookie. as the result every request one session is created. instead of continue with old one. Here root cause is Load balancer. If load balancer redirect the request correctly then this problem is fixed. but how load balancer know in advance about this client before is processed by particular tomcat. HTTP is stateless protocol. so HTTP doesn't help this situation. and other information is jsessionid cookie. its good but its just random value. so we can't take decision based on this random value. Session affinity overrides the load-balancing algorithm by directing all requests in a session to a specific tomcat server. so when we setup the session affinity our problem is solved. but how to setup because session values are random value. so we need to generate the session value some how identify the which tomcat generate response. here we mention jvmRoute="tomcat1" here tomcat1 is worker name of this tomcat. check the workers.properties file in last post. Add this line to all tomcat instances conf/server.xml file and change the jvmRoute value according to workers name and restart the tomcat instances. here tail have which tomcat generate the session. so load balancer easily find out to where we need to delegate the request. in this case its tomcat1. so update all tomcat instances conf/server.xml file to add the jvmRoute property to appropriate worker name values. and restart the instances. all problem is fixed and entire load balance works fine even session based application. tomcat 3 serves 1 user, then suddenly one of instance is failed, then what happen? suppose instance 1 (tomcat1) is failed, then those 2 users lost their session. but their request are redirect to one of the remaining tomcat instances (tomcat2,tomcat3). so they still access the web page. but they lost previous sessions. this is one of the draw back. but its compare to last post load balancer. its works in session based web application also. next post we will see how to set up the session replication in load balancer. please share ur thoughts through comments.